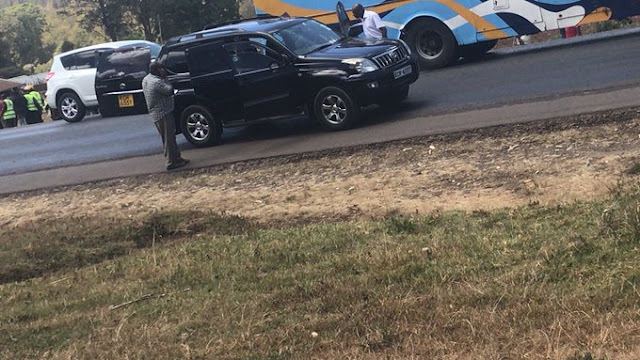 7 suspected thugs were today gunned down in molo kibunja region, the thugs who were in two vehicles were trailed from eldoret Town where they trailed to molo kibunja. The criminals who are believed to be transportating weapons to Nairobi were gunned down by members of the flying squad. The suspects were waylaid as they drove around the area in two vehicles; a Toyota Fielder and Toyota Prado, which they are believed to have been using to carry out their criminal activities. Police say they had trailed them from Eldoret as they had been on their radar. One of the suspects managed to escape as his accomplices came under a hail of bullets in the dramatic midmorning shootout. Police have since launched a manhunt for the suspect who escaped.